In my view, three major (and incompatible) strains of earliest Christianity existed side-by-side in the first century CE: the gnostic, the Jewish Christian, and the Pauline. The gnostic strain was the first. It goes back to a prophet I suggest was Yeshu ha-Notsri (“Jesus the Nazarene”), who lived in the early first century BCE. I have also proposed that early Christian development can be divided into three stages, chronicling the changing view of “Jesus.” In this post I expand on those stages, and include important historical considerations. 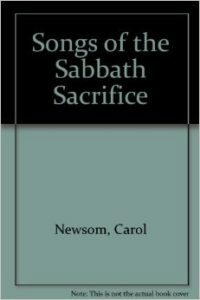 I entitled the lengthy final chapter of my book NazarethGate “In Search of the Rejected Seer.” Those seventy-five pages detail what we know and can comfortably surmise about Yeshu ha-Notsri. He was a very well educated Pharisee from Jerusalem, among the Jewish religious elite and groomed for the Sanhedrin. As a young man, Yeshu fled to Alexandria in Egypt with other important Pharisees during the pogrom of Alexander Janneus, a bloodthirsty tyrant who at one time crucified 800 Pharisees while their families looked on. in the third century BCE. Yeshu stayed in Alexandria for a number of years. It would appear that he became intimately familiar there with non-Jewish traditions. Indeed, we know that he forsook his religious heritage, because he was formally excommunicated from Judaism upon his return to Palestine. Given the subsequent teachings found in the gospels and in non-Canonical Christian literature, I am convinced that Yeshu must have come into contact with Buddhist teachings while in Egypt. This is because the close parallels between sayings of Jesus and those of the Buddha are numerous and uncanny, both in wording and spirit (see my compilation, “Buddhist and Christian Parallels,” PDF). More than that: the world view (or, more correctly, world denying view) of these two religious figures is astonishingly similar. The proposition that Yeshu came into contact with Buddhist teachings is also historically defensible, for we know that Buddhist monks had already been present in Egypt for a long time. 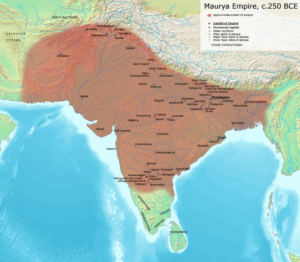 The Indian King Ashoka had begun sending missionaries to the West c. 250 BCE. From the sayings and parables in the canonical gospels and also in the apocryphal literature (particularly the Gospel of Thomas), a core body of teaching can be culled that is inveterately gnostic and world denying. From “Seek and ye shall find” (Mt 7:7) to “He who understands these words will not taste death” (GTh 1) to “My kingdom is not of this world” (Jn 18:36) this teaching is outside both the Jewish and Hellenist world views—yet it resonates fundamentally with the Buddhist religion. In Stage 1 “Jesus” (Heb. Savior) is the abstract gnosis available to all—yet almost impossible to attain. This difficult theology of seeking, self-denial, and disparagement of materiality survives in logia, parables, and texts such as the Gospel of Thomas (“Jesus said…”), but it played an increasingly marginalized role in the further developments of Christianity. 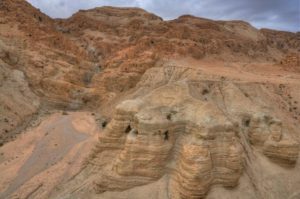 The famous caves at Qumran. The first major development from Stage 1 was the effort to reconcile gnosticism with Judaism. As we have seen, Yeshu’s life and teaching were in radical tension with Judaism—indeed, he was put to death by the Jewish establishment (a core biographical element preserved in the Gospels). We may witness the first attempt at reconciliation between gnosticism and Judaism in the Dead Sea Scriptures. A case can be argued (as I have in the final chapter of NazarethGate) that the Dead Sea Sect was an early offshoot of Yeshuine theology. After all, Yeshu was a Hebrew and he proselytized in Judea. The DSS show strong indications of ongoing tensions between the theology of gnosis on the one hand and Torah Judaism on the other. However, despite considerable creativity in the Yahad (“Community,” as the Dead Sea Sect styled itself), these tensions were never fully resolved. [a] Both were highly placed Pharisees (cf. Acts 9:2; Gal 1:13-14). [b] Both were subjected to persecution (cf. Acts 9:23). [d] The message of both was in some way equivocal—Yeshu’s gnosticism was unacceptable to Jew and Gentile alike; while Paul’s theology was contested at every step of the way (cf. Gal 2, 3; 1 Cor 1, etc). In addition, there are clues in the apocryphal literature that the figure of Paul was originally more ‘Jesus-like’ than the canonical portrayal (cf. Gal 1:15, “But when God, who had set me apart before I was born…”) One must, eventually, pose an astonishing question: did “Paul” even exist? Or was he a later reflection of Yeshu, a creation perhaps of Marcion and of the later tradition? Or perhaps was he in some way merely the “ideal” Christian, the fictive prototype? Ecstatic angelic singers with privileged knowledge praise Yahweh at Qumran. Members of the Dead Sea Sect thought of themselves as possessing privileged knowledge—knowledge not shared by the Jerusalem establishment. At the same time, however, they were ultra-Jewish. Yahweh was, and is, the only God. The creation is good (in disagreement with Yeshu’s teaching). 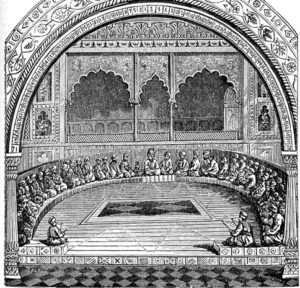 Though the sect was in tension with the Jerusalem hierarchy, it upheld the inspiration of Torah and tradition. This basic worldview continues in so-called Jewish Christianity. “Jesus” is the saving gnosis that indwells the aspirant. At the same time, “Jesus” was foretold by Moses and is fully compatible with Judaism—albeit a ‘reformed’ Judaism. In fact, salvation though “Jesus” requires Jewish tradition and praxis—elements that had proven their worth through the ages. We see from surviving apocryphal texts that the Jewish Christian “Jesus” was not singular—the spirit could indwell any worthy saint, was emphatically transferable, and could even appear to move from one person to another. The spirit Jesus exhorts repentance, confers gnosis on the individual and, in some cases, also the divine power to carry out miracles. The individual, however, is not God (that will come with Jesus the Nazarene of Stage 3). Yahweh alone is God and Jewish scripture is the word of God. Furthermore, the acquisition of “Jesus” is essentially a function of God’s grace and is non-exclusive. Anyone can be saved through grace, can become “Jesus” (or “angelic,” according to some DSS). For Paul, the death on the cross was a one-time event of cosmic redemption. In the early first century of our era, a very different conception developed. Today we call this strain of Christianity Pauline, or Hellenist (as opposed to Jewish Christian). But we have conveniently ignored that the “Jesus” of Paul was not “of Nazareth” (those words do not appear in the epistles) and was emphatically “not of human origin” (Gal 1:11). It was spiritual (see NazarethGate 308–11). As in Jewish Christianity, “Jesus” is the divine, indwelling spirit available to all. However, the recollection of the original prophet had faded and, in a sense, had become romanticized. According to the Pauline view—and here we have the astonishing beginning of the Christian religion we know today—God had intervened one time only in history, in the life of a prophet of the distant past (about whom the Pauline epistles know very little). The sacrificial death of that prophet on the cross—at the behest of the indwelling spirit “Jesus”—had cosmic ramifications. 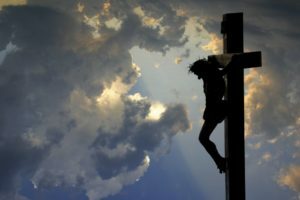 It was payment for man’s sins and redemption from this evil world/existence if one believes. Thus, we can also participate in that death and redemption—and can be saved. To do so, we must allow the spirit Jesus into ourselves though belief, and secondarily through asceticism, chastity, and self-denial. In some ways, then, Pauline theology is a continuation of the gnosticism of Stage 1. The world is still evil (in contrast to Jewish Christianity). The flesh is of no avail. Redemption is from the world and out of it. In these ways (like Yeshu) Paul has left the ambit of Judaism. The Torah is not the last word of God, and Yahweh is not the ultimate God. A higher power exists, a power that is not of this world. Taking the broad view, then, we can see Jewish Christianity on the one hand, and Pauline Christianity on the other, as two attempts to adapt the gnosticism of Yeshu to man’s condition. One attempt maintained the Jewish heritage and outlook. The other did not, but addressed itself primarily to the gentiles. It is possible that some of the above “Pauline” characteristics were actually developed by Marcion (the great champion of Paul) in the early second century. It is also possible that Paul never existed as a human being (his letters are not known before the mid-second century), in which case we must consider that the figure was developed later, out of the ‘Paulinism’ of the first century—perhaps based on the life and teaching of a noteworthy disciple of Yeshu who lived in that century. Sometime in the early second century the first “Catholic” efforts to rise above the welter of conflicting “Christian” views took place. Certain practical people saw that what was needed above all was a superior organization: unity, centralized power, and a hierarchy of command. Let us be quite clear at the outset: the Catholic Church was not formed out of an interest in “truth,” nor out of the pure intention to help one’s fellow man. It was formed out of the desire for worldly power. If there is a single abiding characteristic to the history of the Church, it is this: over and over, truth has been sacrificed to the exigencies of power. Indeed, the Church has always defined “truth” quite shamelessly as that which furthers its own interests. The main problem preventing Church organization was the decentralized christology of Stage 2. Centralization was impossible so long as anyone could claim to possess the ‘indwelling Jesus.’ The incipient Church’s solution was both bold and clever: the invention of a God-Man who was the only Jesus, once and for all. Precedents for such a divine man (theios aner) existed all around in the Hellenistic world. Apollonius of Tyana (d. ca. 100 CE) was perhaps the most recent and closest model. He was a miracle worker, Man-God, and wanderer. The Church’s Jesus the Nazarene was even more impressive than Apollonius. In the Gospel of Mark Jesus raises people from the dead, walks on water, multiplies food for thousands, commands the elements, and so on. For the Church, of course, Jesus is no longer limited to the flesh—He is God Himself. And the Catholic Church is God’s only representative on earth. It is clear that the incipient Church borrowed elements from both Jewish Christianity and from Paulinism. In order to salvage the creation (essential for a religion to become popular) it endorsed Judaism’s positive outlook regarding materiality. The creator Yahweh also became the Church’s God. Now, however, He had sent His Son in a “New Covenant.” Thus, Jesus does not come to abolish the Law or the Prophets, but to fulfill them (Mt 5:17). Jewish scripture would be honored as ‘preparatory’ to the Church. From Paulinism (indeed, probably from Marcion), the Church borrowed the break-through idea that salvation came as the result of a cosmic sacrifice by “Jesus” on the cross at some time in the past—together with the implications of redemption (through belief) and atonement for sin. It may be, in fact, that Marcion first brought these astounding conceptions to Rome as late as the 140s CE. If so, this would explain the tremendous furore he caused. It would also mean that “Paul” (whose epistles were first presented by Marcion) was either (1) a creation of Marcion or (2) was first popularized by Marcion. For “Paul,” Jesus is God’s spirit. It was not the “Jesus” that died on the cross—like God, Jesus is eternal. But the prophet in whom Jesus abided indeed died in a cosmic sacrifice. This once pervasive view (separating Jesus from the prophet) developed into “docetism”—the notion that Jesus didn’t really die. We can now understand, however, that the accusation of docetism is a mutilation of the original doctrine. It’s corollary is the similar accusation that “Jesus did not come in the flesh.” This is only partially correct, for the ‘indwelling spirit’ christology (Stage 2) viewed Jesus as not of flesh but in the flesh. Such theological niceties, however, were soon thrown into the shade by Jesus of Nazareth. On the negative side, the Church rejected certain elements of Jewish Christianity: it did not accept the exclusivity of the Hebrew people, nor the necessity of Jewish praxis. The New Covenant would be for both Jew and Gentile. The Church also rejected certain elements of Paul/Marcion: that the creation is evil; that there is a higher God; encratism (the need for chastity), and that the disciples did not understand Jesus at all. The latter point bears some discussion. 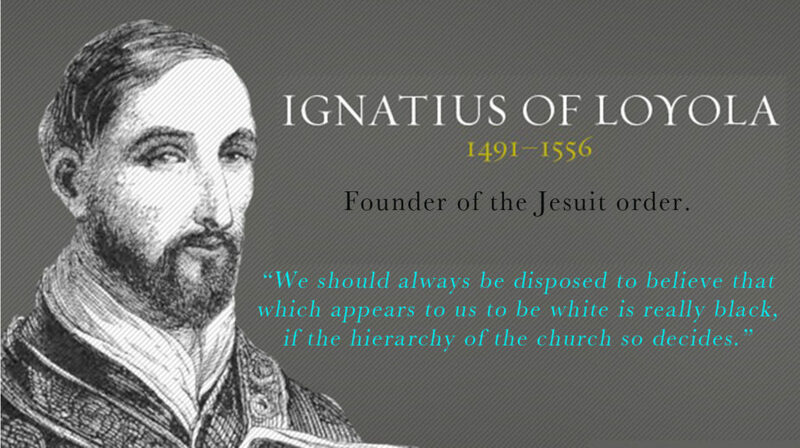 It was critically important that the Church be established on Jesus’ own teaching in history. All depended on a physical lineage of authority going back to Jesus. Thus, at least some of the apostles needed to understand Jesus’ message and to recognize him as the “Christ.” This is precisely what Peter does at Mk 8:29—arguably the high point of that gospel. Matthew is even more explicit: he makes Peter the “rock” upon which the Church is built (Mt 16:18). 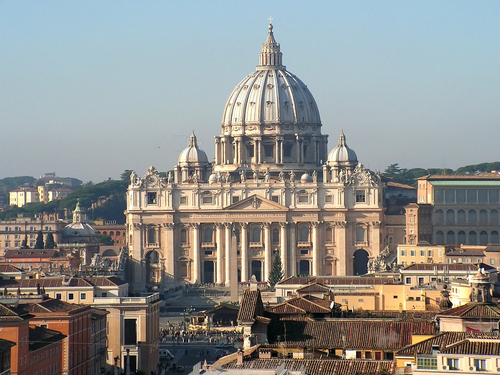 All this is transparently political: it’s purpose is to shore up the Church’s power.